League administrative work can be exhausting. We built powerful tools to expedite your workflow. Now you can focus on what's important, the players. 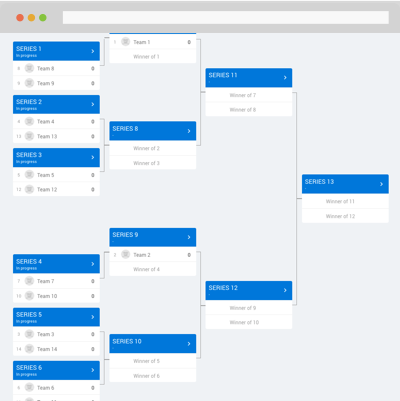 Organize your league's playoffs or tournament by using HC's playoff brackets. Let the system automate and progress teams into the next round, or move them manually based on your preference. Schedule teams with ease by getting real-time insights including number of games vs each opponent, number of late games, and more. Gone are those days of collecting and cashing out cheques. Set up payment plans to collect and manage fees from players. Quick registration process with an online payment solution to get players and teams signed up faster. Forget about having to chase down each player at the rink with a stack of papers, let the website handle it all. With insightful data, your dashboard will help you keep track of everything thats going on with your league at a glance. Have full control of your website and customize the theme and layout for a unique look. Playoffs - easily import regular season teams with eligible players to playoff mode. Quick scoring: Upload game scores immediately without inputting all stats. Add multiple staff members to help manage your league. Send out custom league notifications to teams or just the captains. Player happiness is critical to the success of your league! Amaze your players with industry leading technology that will keep them engaged. 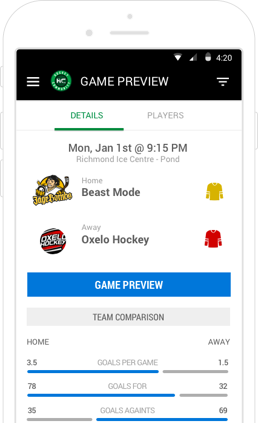 Your players will receive scores, league updates, game reminders, and team messages, all from the Hockey Community app. They will also have complete access to hockey resources and a community of players around the globe. Keep track of attending players and spares for every game. Players can RSVP to games on the app. Keep track of attending players and spares for every game. Scout who you're about to play with automatically generated pre-game insights. Continue the conversation after the game with post-game summaries of game highlights. Stop chasing players for fees. Give players the ability to pay team fees directly on the HC app. Captains will be able to set up practices, scrimmages and other events for their teams. Promote them privately or share them with the public. Strategize with teammates before games in your own team "locker room". Get everyone up to date with real-time chat, available on the web and mobile. Improve roster attendance and set game reminders to keep your players up to date about the next game. View schedules, standings, rosters, and scores all on the web or your mobile device. Teams & players get their own dedicated profile page, displaying stats, schedules, andachievements. Players can see who their optimal linemates are with the "Linemate Chemistry" card. Set event reminders to notify your players of your next game.